1. Pre-heat oven to 375F. 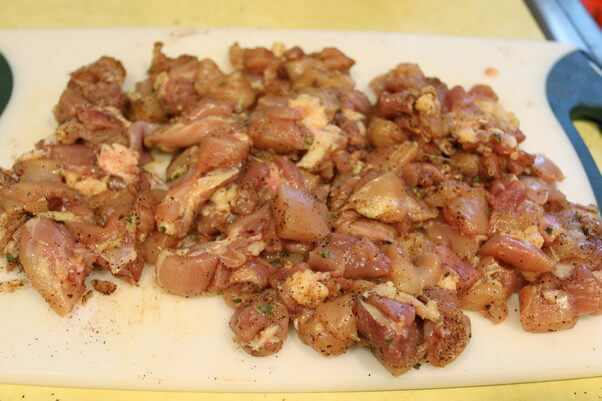 Using kitchen shears, chop chicken into bite-size chunks. Season chicken with salt, pepper, and chili seasoning. 2. 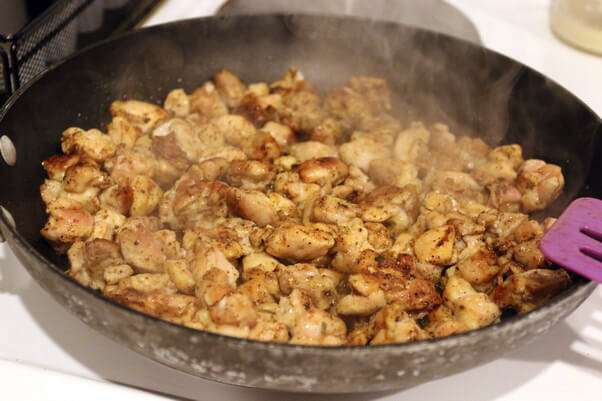 Over medium-high heat, cook chicken in olive oil until browned on all sides. 3. 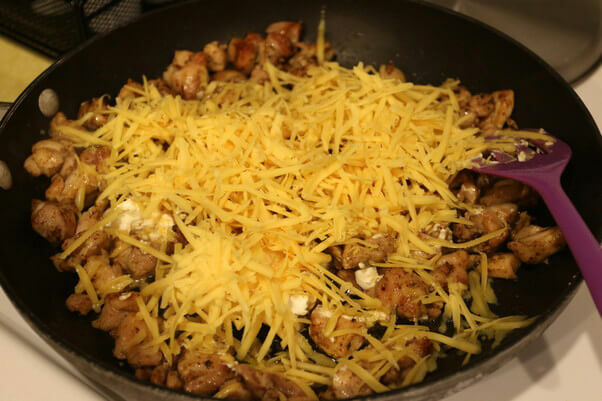 Add cream cheese, sour cream and 3/4 of the cheddar cheese to the chicken, then stir together until melted and mixed. Add tomatoes and green chili and mix well. 4. 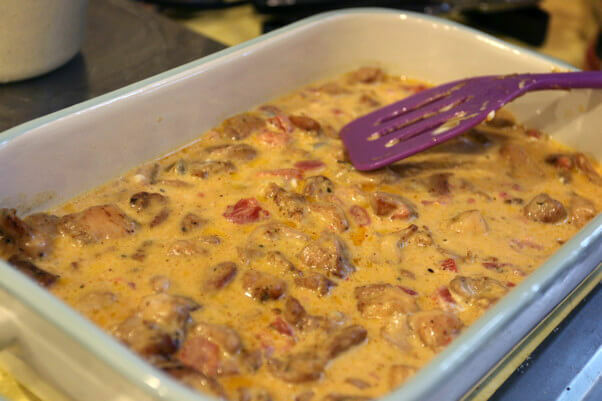 In a casserole dish, add chicken mixture from the pan. 5. Microwave frozen cauliflower until cooked through. Use an immersion blender to blend with remaining cheese into a mashed potato-like consistency. Season with salt and pepper. 6. Cut a jalapeno into chunks. 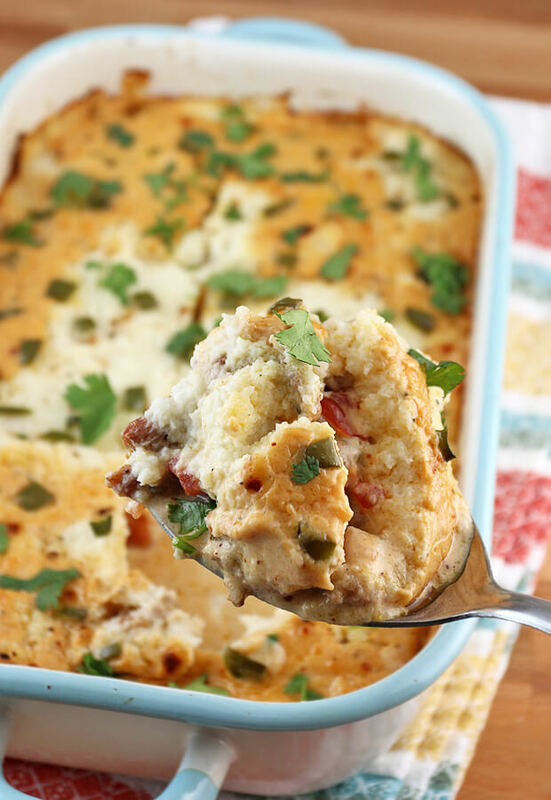 Spread cauliflower mixture over the top of the casserole, then sprinkle jalapeno pepper over the top. 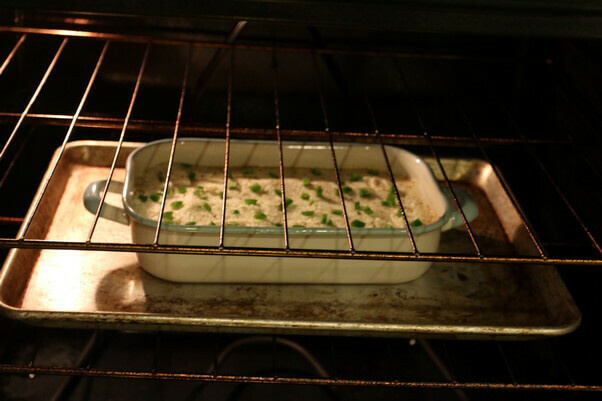 Bake for 15-20 minutes or until some color is on the top and the jalapenos are cooked. 7. Slice and serve. Some fresh chopped cilantro tastes great over the top! Pre-heat oven to 375F. Chop and season chicken, then cook over medium-high in olive oil until browned. Add cream cheese, sour cream and 3/4 of the cheddar. Stir together until melted and mixed. Add tomatoes and green chili and mix well. 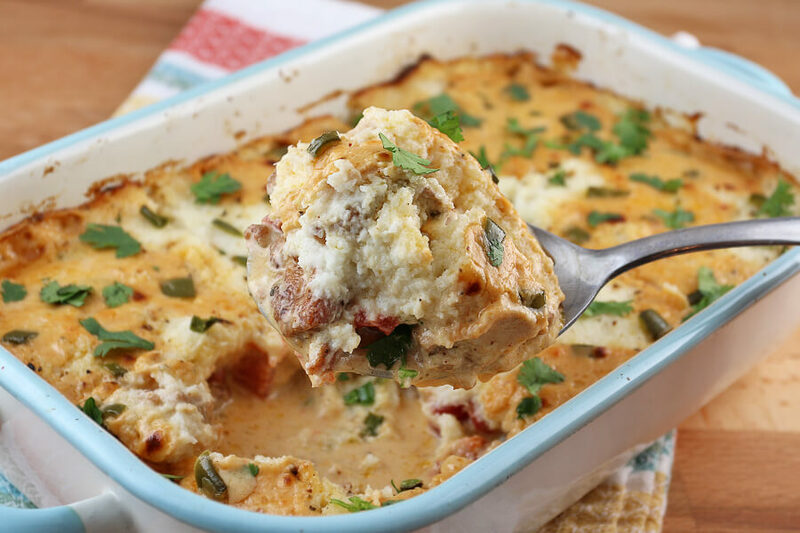 Add everything to a casserole dish. Microwave frozen cauliflower until cooked through. 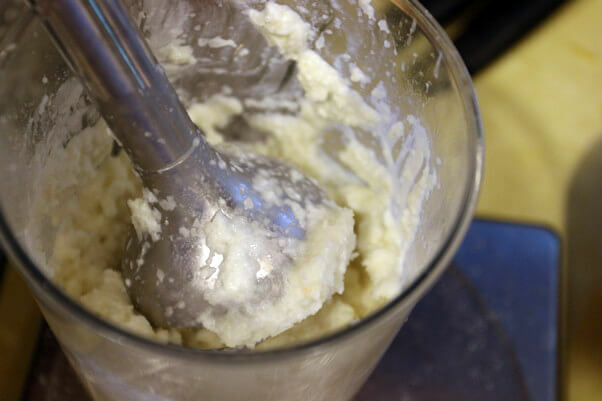 Use an immersion blender to blend with remaining cheese into a mashed potato-like consistency. Season to taste. Cut a jalapeno into chunks. 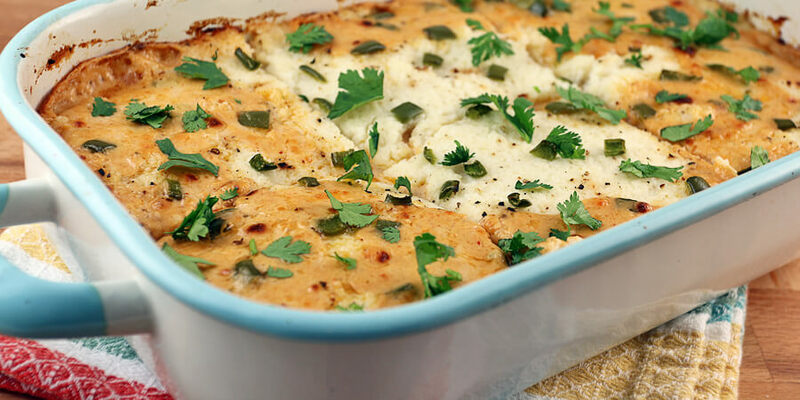 Spread cauliflower mixture over the top of the casserole, then sprinkle jalapeno pepper over the top. Bake for 15-20 minutes.